This week on Gimme Some Truth, we have a new episode, about insurance with guest Rod Crandall – you can check it out on iTunes or SoundCloud. Below, you can read Jonathon’s first blog post as a member of Walkner Condon, where he talks about his son Jachin, Make-A-Wish, and their foundation. There are certain moments in your life that will stay with you forever. Maybe it is the day you first learned how to ride a bike. For some, it could be the day you got married or the birth of a child. There are also painful ones as well because life is not always perfect. I have a memory that is seared into my heart that I would love to share with you because it has opened so many doors for myself and my family. It is not a memory that I wish for anyone to have to experience, but if they have to, I hope that they would be able to share in the feeling of blessing and joy that it brought. My wife and I had our third child 10 years ago. We knew he was a boy after the ultrasound and were excited to welcome him. We planned to name him Jachin and had so many hopes and dreams for the future. What we did not plan for was to find out immediately after he was born that there were significant abnormalities with him. He was born with a birthmark covering 70% of his body, he had one arm that was larger than the other, and his head was off the charts for size. There were a lot of anxious moments and doctors visits in the first few days in the hospital as we adjusted to this change of plans and we even talked about our “new normal.” We had two other healthy kids at home that needed our attention and the rest of our family lived out of town. As the weeks turned to months, we found out that Jachin had Sturge-Weber Syndrome, Glaucoma, and Klippel-Trenaunay syndrome. He was hospitalized numerous times with debilitating seizures and had many procedures to try to control the glaucoma and birthmark. I made the decision in early 2008 to change my career from one in the medical field to become a financial advisor. I was not able to travel and I thought the ability to help people, yet control my schedule would allow me to still provide for my family with an income as well as the support we needed to get through. It was by far the best career decision I could have made. When Jachin was 5 years old, we had been adjusting to him going to Kindergarten as well as moving our family to Waunakee a few years earlier. Things were going well at work and Ellen and I were raising 4 great kids. At a visit with Jake’s pediatrician (one of countless doctors office visits we still continue to have), we were told about Make-A-Wish and how we should apply for a wish for Jachin. As I thought about it, I could not imagine, when there are other kids that we had met at the American Family Children’s Hospital, why Jachin would qualify and I felt guilty that if he did that someone else would potentially not get a wish because Jachin had. I reluctantly applied and it came as a shock to find out that it was actually the Doctors who determined the eligibility for a wish and that Make-a-Wish attempts to grant 100% of the wishes for eligible kids. 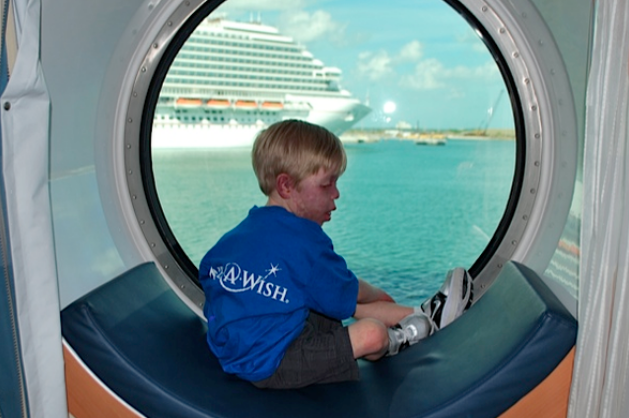 This began an amazing journey that included the team responsible for building the wish, the team that helped organize and plan the wish, and the amazing team at Disney who made Jachin’s dream of meeting Mickey Mouse on a big boat come true. As I sat there and watched the joy on my son’s face, the moment that I will never forget happened. I realized that I could pay for this trip for my family, but I could never buy the experience that Make-A-Wish gave to not only my son but also to our entire family. I needed to pay this forward. Immediately upon return from Jachin’s trip, we began the process of becoming wish sponsors. At that time, we had been hosting a golf outing that had brought in over $100,000 to support The Sturge-Weber Foundation. We decided to create our own foundation, called The JAKE Foundation, which could still support Sturge-Weber research but also other great organizations like Make-A-Wish of Wisconsin and the American Family Children’s Hospital in Madison. Since then we have been able to sponsor 8 wishes, including the one that we announced recently when Ellen, Jake and I shared our story on Z104 during the Make-A-Wish Radio-A-Thon. It has been the biggest honor of my life. I don’t know what the future holds but I will always be a part of making a difference in our community. The JAKE Foundation (Jachin’s Angel Kisses Everywhere) is committed to raising awareness and money toward this effort. Earlier this year, Make-A-Wish contacted us to let us know that the child whose wish we sponsored was from our hometown of Waunakee. Her name is Isabelle Dunai and she is an amazing young woman with a great family. Isabelle was able to go to Colorado to see the mountains with her family, and even though she continues to fight her health situation, came to our golf outing and shared her inspirational story. This is just our story and there are countless others out there. There are also many other organizations that offer the chance for those who are charitably inclined to make a difference. I hope that anyone who takes the time to read this has the chance to be a part of supporting others through these organizations. If they are 501(c)3 non-profits, they offer a tax-deductible contribution as well. If you ever have questions about how to do this, how it could benefit you at the end of the year, or how to set up your own I am willing to sit down and talk to you. You never want to be in the situation that I was, seeing my baby boy have his wish granted, but I only hope that you have the opportunity to feel how great it is to make a difference in the life of another. It is literally life-changing. You can listen to the Jordans’ Make-A-Wish story on Z-104 here. Click here to check out the JAKE Foundation website. If you’d like to talk to Jonathon about non-profits and foundation work, you can schedule an appointment.